Stained Glass Pendant, orange and streaky peach jewelry, handmade necklace. 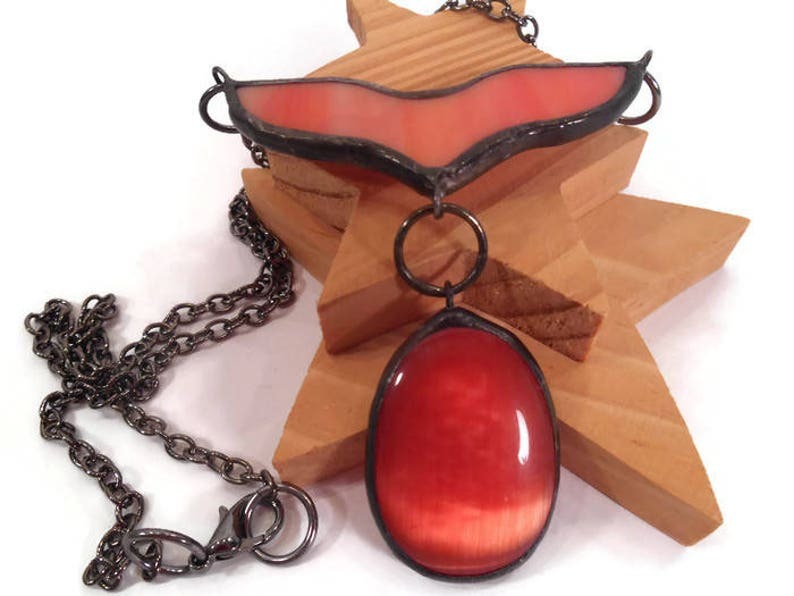 This unique pendant is created using a streaky peach stained glass, cut in a fishtail design with a large soldered o ring connecting it to a beautiful deep orange cats eye glass cabochon. The stained glass and cats eye cabochon were wrapped in copper foil (tape) and then a generous amount of lead free solder was applied. The necklace was then given a dark patina, waxed and polished to a shine. This very pretty fishtail pendant comes packaged in a handmade (by me) fleece gift bag that is ready for gift giving or safe keeping. Your unique pendant is hung on a 24 inch or 61 cm link chain with a lobster clasp and matches the colour of the patina. I believe this Pendant is a real statement piece that is sure to get complements.